This article is about the franchise. For the original manga, see Yu-Gi-Oh! (manga). For the Toei anime series, see Yu-Gi-Oh! (Toei anime). For the first NAS anime series, see Yu-Gi-Oh! (anime). For other uses of Yu-Gi-Oh! or "King of Games", see Yu-Gi-Oh! (disambiguation). Yu-Gi-Oh! (遊☆戯☆王 Yūgiō, Japanese for "Game King") is a popular Japanese anime and manga franchise from Kazuki Takahashi that mainly involves characters who play a card game called Duel Monsters (originally called Magic & Wizards in the manga. See the section "Card game" below for different names of the game) wherein each player purchases and assembles a Deck of Monster, Spell, and Trap Cards in order to defeat one another and gain victory. The Yu-Gi-Oh! universe currently consists of four manga series, six anime series, and three films. The Yu-Gi-Oh! (遊☆戯☆王, Yūgiō?) manga ran from 1996 to March 8, 2004. It was created by Kazuki Takahashi, and was one of the most popular titles featured in Shueisha's Weekly Shōnen Jump. The manga initially focuses on Yugi Mutou, as he uses games designed by Pegasus to fight various villains. Yugi also gets into misadventures with his friends Katsuya Jonouchi, Anzu Mazaki and Hiroto Honda. The plot starts out fairly episodic and includes only three instances of Magic and Wizards in the first seven volumes. In the eighth volume, the Duelist Kingdom arc starts, making the plot shift to a Duel Monsters-centered universe. The editors were Yoshihisa Heishi and Hisao Shimada. Kazuki Takahashi credits Toshimasa Takahashi in the "Special Thanks" column. The English version of the Yu-Gi-Oh! manga is released in the United States and Canada by Viz Media in both the Shonen Jump magazine and in individual graphic novels. The original Japanese character names are kept for most of the characters (Yugi, Jonouchi, Anzu, and Honda, for instance), while the English names are used for a minor number of characters (e.g. Maximillion Pegasus) and for the Duel Monsters cards. It is published in its original right-to-left format, and the manga is largely unedited. The translators of the English manga are Anita Sengupta (for volumes 1-7, and Duelist 1) and Joe Yamazaki (for Duelist 2-24 and Millennium World). Some content was revised in later printings of earlier volumes. Viz released volumes 1 through 7 of the Yu-Gi-Oh! manga under its original title. The Duelist Kingdom and Battle City arcs are released under the title; Yu-Gi-Oh! : Duelist, while the Egypt arc is released as Yu-Gi-Oh! Millennium World. As of the December 2007 issue, the series has come to a close, after a long five year run in the pages of Shonen Jump, America. Yu-Gi-Oh R (遊☆戯☆王 R, Yūgiō Āru?) is illustrated by Akira Ito, one of the artists who illustrated the original Yu-Gi-Oh! manga, and supervised by Takahashi. Yu-Gi-Oh! R is a spin-off of the original Yu-Gi-Oh! franchise, with most of the same characters in a new plotline (which takes place between the Battle City story arc and the Millenium World story arc). The manga was first published in Shueisha's monthly magazine V-Jump on April 21, 2004. The Yu-Gi-Oh! GX (遊☆戯☆王 GX, Yūgiō Jī Ekkusu?) manga series is a manga adaptation of the Yu-Gi-Oh! GX television series. The comic is illustrated by Naoyuki Kageyama and differs from the anime, featuring new storylines and monsters, as well as some personality changes in some of the characters. The Yu-Gi-Oh! GX manga series was released in North America by Viz Media. It has been serialized in the manga magazine Shonen Jump, beginning in January 2007. Unlike the other manga serialized in the magazine, one chapter of the manga is printed per issue. Unlike the English-language editions of the original manga series, the English-language Yu-Gi-Oh! GX manga uses the English-language anime names created by 4Kids Entertainment. The GX episodes are rated 11+. A Yu-Gi-Oh! 5D's (遊☆戯☆王 5D's, Yūgiō Faibu Dīzu) manga began serialization in V-Jump Monthly Magazine from August 2009. It is written by Masahiro Hikokubo and Satou Masashi and, like the GX manga, features different storylines and monsters. A Yu-Gi-Oh! ZEXAL (遊戯王 ＺＥＸＡＬ, Yūgiō Zearu) manga began serialization in V-Jump Monthly Magazine December 18, 2010, before its anime counterpart debuted. The beginning of the manga contains the same events as the anime, but the story starts to diverge in Rank 10, leading to a completely different storyline. The series is written by Shin Yoshida, illustrated by Naohito Miyoshi and published by Shueisha. Kazuki Takahashi also supervises the series. A Yu-Gi-Oh! ARC-V (遊☆戯☆王ＡＲＣ－Ⅴ, Yūgiō Āku Faibu) manga began serialization in V-Jump Monthly Magazine August 20, 2015. The series is written by Shin Yoshida, illustrated by Naohito Miyoshi and published by Shueisha, while the Duels are written by Masahiro Hikokubo and Kazuki Takahashi supervises the series. Like the GX and 5D's manga, the characters' personalities differ from the anime and the storyline and monsters are different. Yu-Gi-Oh is produced by Toei Animation, as a 27-episode anime, based on Yu-Gi-Oh! manga volumes 1-7, volumes which do not focus much on Magic & Wizards, nor is it connected in any way to Yu-Gi-Oh! Duel Monsters; another Yu-Gi-Oh! anime series made by Nihon Ad Systems (NAS), but is often referred to as the "first series" to distinguish it from the latter (or, erroneously, as Yu-Gi-Oh! Season/Series 0.) The show first aired on TV Asahi on April 4, 1998, and ended its run on October 10, 1998. This show was never shown outside Japan, presumbly due to the amount of violence involved in the series. "Yu-Gi-Oh! ", known in Japan as Yu-Gi-Oh! Duel Monsters (遊☆戯☆王 デュエルモンスターズ, Yūgiō Dyueru Monsutāzu? ), is the series that introduced Yu-Gi-Oh! to the Western world. It was produced by NAS, and was first aired on TV Tokyo on April 18, 2000. It was later translated into more than 20 languages, airing in more than 60 countries. The series is mainly based on Yu-Gi-Oh! manga volume 8 (except that it has some of the content of volumes 4 and 5, albeit watered down and shortened) and onward, and ended its 224-episode run in Japan on September 29, 2004. Broadcasts The 4Kids English Yu-Gi-Oh! anime is broadcast on many channels. In the United States, it is broadcast on Kids' WB!. In Canada, it is broadcast on YTV. In the United Kingdom it is broadcast on Nickelodeon, CITV (Children's ITV) on Freeview Channel 72, ITV2, ITV4, and in Australia on Network Ten and Nickelodeon. Like many anime originally created for the Japanese market, a number of changes (including the names of most of the characters) were made when the English Yu-Gi-Oh! anime was released. During the dubbing process, the broadcast version of Yu-Gi-Oh! was edited and adapted to suit US cultural tastes. On October 19, 2004, 4Kids (in association with FUNimation) released uncut Yu-Gi-Oh! DVDs. These DVDs include the original, unedited Japanese animation and Japanese dialogue tracks with English subtitles, as well as all-new English dubs with translations closer to the original dialogues. Both language tracks use the original Japanese music. Each DVD contains three episodes; and there was a total of 3 DVDs released for a total of 9 episodes. The fourth DVD, called "Yu-Gi-Oh! Uncut Vol. #04: Red-Eyes Black Dragon DVD" (and containing episodes 10-12), was already dubbed and completed; ready to be sold and scheduled for release on May 4, 2005, but was never officially released. A 5th DVD containing episodes 13-15 was also mentioned around the time of the announcement of the fourth DVD (and before the indefinite delay/cancellation) but it is unknown if the DVD was merely planned for release or was actually completed and ready for release like the 4th DVD was. For a few months the release date(s) for the 4th DVD had been constantly extended or delayed, until it was confirmed that the product was not to be sold for an unknown amount of time, if ever. Shortly after that it had been confirmed 4Kids had decided to 'indefinitely delay' future releases of the series, saying that it was 'competing' with sales of their edited version DVDs and that they had decided to stop the uncut DVDs to stop the competition. (supposedly for a limited amount of time until all their edited DVDs were released and competition was over.) However, even now after all versions of their edited DVDs have been sold there still is no news on whether or not they plan to bring back the Uncut series. To this day the fourth DVD (and possibly fifth) still remain unreleased and the current status of the uncut DVDs and their future is unknown. In May 2009, 4Kids Entertainment began to release full, uncut, English-subtitled Japanese-language Yu-Gi-Oh! episodes through their YouTube account. Many fans were very happy with this recent development, but those subtitled episodes were criticized for using the English dub character names in the subtitles as opposed to the Japanese names. 4Kids stated that they planned to release the entire series subtitled on their YouTube channel in the near future, but an announcement in August 2009 stated that all the Japanese episodes were to be removed due to legal issues with ADK (one of the primary producers of the anime) and Shunsuke Kazama, the original Japanese voice of Yugi. However, the English dub is still available, and 4Kids still plans to release subtitled versions of Yu-Gi-Oh! GX and Yu-Gi-Oh! 5D's, along with their English counterparts. However, due to the legal issues with Kazama, 4Kids has stated that they may have to drop all of the audio for Yugi's lines. Set a few years following the events of the previous series, Yu-Gi-Oh! GX (known as Yu-Gi-Oh! Duel Monsters GX in Japan) follows a boy named Judai Yuki (Jaden Yuki in the English version) as he attends Duel Academy in the hopes of becoming the new Duel King. The series ran for 180 episodes between October 6, 2004 and March 26, 2008. Like the previous series, 4kids handled western distribution and made several edits. Yu-Gi-Oh! Capsule Monsters (遊☆戯☆王 カプセルモンスターズ, Yūgiō: Kapuseru Monsutāzu?) is a twelve-episode anime commissioned, produced and edited by 4Kids (much like Yu-Gi-Oh! The Movie - Pyramid of Light). It is set before the end of the second Yu-Gi-Oh! anime series (Yu-Gi-Oh: Duel Monsters), apparently somewhere in season 5. 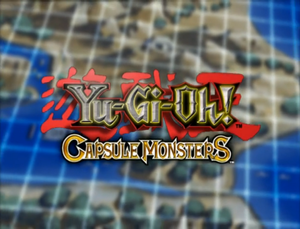 Capsule Monsters involves Yugi (Yūgi), Joey (Jōnouchi), Téa (Anzu), Tristan (Honda) and Yugi's grandfather Solomon (Sugoroku) being pulled into a world where Duel Monsters are real. They find monster capsules that they can use to summon monsters. It is similar to the Virtual RPG arc in many respects, but it does not seem to have anything to do with the early Capsule Monster Chess game featured in early volumes of the original manga. It is currently the only animated Yu-Gi-Oh! media not to be released in Japan. Yu-Gi-Oh! 5D's (遊☆戯☆王 5D's, Yūgiō Faibu Dīzu? ), is another anime spin-off of the original Yu-Gi-Oh! franchise, with a new protagonist (Yusei Fudo) and a new plotline revolving on five dragon cards which when brought together, will revive a beast called the Crimson Dragon. The main difference between this and other "Yu-Gi-Oh!" shows is that they focus on duel on motorcycles in stadiums using duel disks called Duel Runners, and a new breed of monsters called Synchro Monsters are introduced. It started airing on TV Tokyo on April 2, 2008, and started airing in the United States on September 13, 2008, once again licensed by 4Kids and featuring similar edits. The spin-off also begins the trend of introducing new Summon mechanic to the series, with this one being "Synchro Summon". A new Yu-Gi-Oh! series is to be announced at the Japanese encore screening of Yu-Gi-Oh! 3D Bonds Beyond Time on February 20, 2011. It is to be called Yu-Gi-Oh! ZEXAL. In the near future, the main character's name is Yuma Tsukumo as he is encountered by a spirit named Astral. They are working together to gather the scattered and dangerous "Number" cards. They are the missing pieces of Astral's memory. This series also introduces a new type of Summon called "Xyz Summon". Yu-Gi-Oh! ARC-Ⅴ (read as "Arc Five") is a Yu-Gi-Oh! anime series, the fourth main spin-off series, which began airing in Japan on April 6, 2014, following the end of Yu-Gi-Oh! ZEXAL. The series focuses on a new protagonist, Yuya Sakaki. As with the previous spin-offs, it focuses on and introduces a new type of Summoning - this time, "Pendulum Summon". Unlike other Spin-offs, this spin-off does not reduce the importance and the appearances of previously introduced Summons to focus on the newly introduced one - Fusion, Synchro, Xyz Summon still retain importance. With a brief Ritual Summon present. Yu-Gi-Oh! VRAINS is the fifth main spin-off of the Yu-Gi-Oh! anime series. It is scheduled to air in Japan in May 2017, following the end of Yu-Gi-Oh! ARC-V. It features a new main protagonist, Yusaku Fujiki. As with the previous spin-offs, it focuses on (and introduces) a new type of Summoning - this time, "Link Summon". The first film of the series was simply titled Yu-Gi-Oh! and was released only in Japan. A thirty-minute film produced by Toei Animation, it was first shown in theaters on March 6, 1999. Its characters are from the first series Yu-Gi-Oh! anime. The film is about a boy named Shōgo, who is too timid to duel, even after he got a powerful rare card; the legendary Red-Eyes Black Dragon, in his Deck. Yugi tries to bring Shōgo's courage out in a duel with Seto Kaiba, who has his eyes on Shōgo's rare card. Yu-Gi-Oh! The Movie: Pyramid of Light, often referred to as simply Yu-Gi-Oh! The Movie, was first released in North America on August 13, 2004. The film was developed specifically for Western audiences by 4Kids based on the overwhelming success of the Yu-Gi-Oh! franchise in the United States. Warner Bros. distributed the film in most English-speaking countries. Its characters are from the second series Yu-Gi-Oh! anime. In the film, Atem faces Anubis, the Egyptian God of the Dead. The extended uncut Japanese version of the film premiered in special screenings in Japan on November 3, 2004 under the title Yu-Gi-Oh! Duel Monsters: Pyramid of Light. The film was then aired on TV Tokyo on January 2, 2005. Attendees of the film during its premiere (U.S. or Japan) got 1 of 4 free Yu-Gi-Oh! Trading Card Game cards. The cards were Pyramid of Light, Sorcerer of Dark Magic, Blue Eyes Shining Dragon and Watapon. The Home Video Release also gave out one of the Free Cards with an offer to get all 4 by mail (though the promotion ended in December 2004). In Australia, New Zealand, Germany and the United Kingdom, free promotional cards were also given out, however, they were given out at all screenings of the film, and not just the premiere. Two fans managed to steal a box of 2,400 cards in California. Disguised as Warner Bros. workers, they made off with the cards, claiming that wrong cards were sent, and promising a new shipment. Yu-Gi-Oh! 3D Bonds Beyond Time, known in Japan as Yu-Gi-Oh! Movie: Super Fusion! Bonds that Transcend Time (劇場版　遊☆戯☆王　～超融合！時空を越えた絆～, Gekijō-ban Yūgiō ~Chō-Yūgō! Jikū o Koeta Kizuna~? ), also known as Yu-Gi-Oh! 10th (遊☆戯☆王 10th?) is a 3-D film released on January 23, 2010 in Japan, with a North American release in Spring 2011. It celebrates the 10th anniversary of the first NAS series (as opposed to the anniversary of the manga) and features an original storyline involving Yugi Muto, Jaden Yuki (Judai Yuki) from Yu-Gi-Oh! GX and Yusei Fudo from Yu-Gi-Oh! 5D's, fighting against a new enemy named Paradox. It was first teased with short animations featured at the start of episodes of Yu-Gi-Oh! 5D's during the third season. The main characters of Yu-Gi-Oh! (all anime, manga and films except Yu-Gi-Oh! GX, Yu-Gi-Oh! 5D's, Yu-Gi-Oh! ZEXAL) are Yugi Mutou (spelled Yugi Muto in the English anime), a shy, pure-hearted high school student and gaming expert who possesses an ancient Egyptian relic called the Millennium Puzzle. Another character is named the Nameless Pharaoh or Yami Yugi (also known as Dark Yugi, "the other Yugi" and eventually "Atem"; the latter is his real name, revealed only near the end of the series), a darker personality held in the Millennium Puzzle. Yugi's best friends, Katsuya Jonouchi (Joey Wheeler in the English-language anime versions), Anzu Mazaki (Téa Gardner) and Hiroto Honda (Tristan Taylor) are also primary characters, as well as Yugi's main rival, Seto Kaiba. The main character of Yu-Gi-Oh! GX is Jaden Yuki (Judai Yuki in the Japanese versions), an energetic boy who possesses great talents in Duel Monsters. He can also communicate with the spirits of certain cards. Jaden attends a special academy to study how to play Duel Monsters. Jaden combats various opponents who seek to control/destroy the world, battling the Sacred Beast cards, the Society of Light, Nightshroud, and The Supreme King (who Jaden later turns into himself). While Jaden is a poor student, his Dueling aptitude is regarded as the best in the whole school, despite his grades and Dorm Rank. He has had rivalries with many of the other duelists attending there, including Chazz Princeton, Zane Truesdale, Bastion Misawa, and Vellian Crowler. The main character of Yu-Gi-Oh! 5D's is Satellite resident Yusei Fudo, a genius mechanic, adept Duelist, and Signer. His rival is another Signer named Jack Atlas, who betrayed Yusei and his friends in order to get out of Satellite. Other important characters are Akiza, another Signer and Duelist with psychic powers, the twin siblings Luna and Leo, and Crow Hogan. Yusei and his fellow Signers battle the Dark Signers, the Earthbound Immortals, Yliaster's Three Emperors, and finally their leader Z-one. All three of these Duelists teamed up in Bonds Beyond Time to battle Paradox, a time traveling agent sent by Z-one in an effort to change the future of the world and save it from destruction by destroying the card game in the past. The Duel Monsters themselves (as the primary battle agents in the series' card duels), come into play as characters from time to time, especially Kuriboh, Dark Magician, Dark Magician Girl, Jinzo, and the Ojama Trio. Generally, Duel Monsters like the Egyptian God Cards, the Legendary Dragons, the Sacred Beast Cards, the Neo-Spacians, the Five 'Signer' Dragons of 5Ds, the Earthbound Immortals, Meklord Emperors, the Number Xyz Monsters and the Four Dimensional Dragons are of much greater importance to the various storylines rather than other Duel Monsters. The main characters of Yu-Gi-Oh! ZEXAL are Yuma Tsukumo, a hot-blooded boy introduced as a notoriously poor Duelist at the beginning of the series who holds a belief that Dueling a person makes them your friend, and Astral, an otherwordly amnesic being whose memories have scattered into the 100 Number cards. The Numbers are also sought by other parties and individuals, including Shark, the skilled number one bully of the school, Kite Tenjo, a Number Hunter working for Dr. Faker, the mysterious Vetrix Family, and the Barians, the sworn enemies of Astral World who drive the search for the Numbers behind the scenes. Behind the actions of the Barians is their deity, Don Thousand. The main character of Yu-Gi-Oh! ARC-V is Yuya Sakaki, a "Duel-tainer" who acts to entertain the crowd during the new Action Duels. He creates the new Pendulum Summoning method and is soon targeted by those who want access to the cards in addition to being caught up in the interdimensional struggles that he and his childhood friend Zuzu Boyle are linked to. Opposing Professor Leo Akaba is Yuya's rival Declan, who has formed a team of "Lancers" to combat the extradimensional threat, which include Yuya's friend Gong, rival Sylvio, and enigmatic and scarred Shay. Yu-Gi-Oh! tells the tale of Yugi Muto, a shorter-than-average high school student who was given the fragmented pieces of an ancient Egyptian artifact, the Millennium Puzzle, by his grandfather. Upon reassembling the Puzzle, he is possessed by another personality who is later revealed to be the spirit of a 3,000-year-old Pharaoh (5,000-years-old in the English anime) called Atem, with no memory of his own time. As the story goes on, the two of them (together with Yugi's friends), try to find the secret of the Pharaoh's lost memories and his name, with the Duel Monsters card game being an ever prevalent backdrop or plot device. Yu-Gi-Oh! GX, set 10 years after the first series, follows the story of Jaden Yuki (Judai Yuki in the Japanese version), a talented young duelist who is given the card "Winged Kuriboh" by the now-adult Yugi before Jaden's admission to Duel Academy (Duel Academia in the Japanese version), an elitist boarding school established by Seto Kaiba. Jaden (who receives low marks in his admission tests), is placed in the Slifer Red dormitory (Osiris Red), which is reserved for students with the lowest grades. The story goes on as Jaden faces challenges from different students in Duel Academy. He later finds himself entangled in a conflict related to the hidden secrets of the academy. Yu-Gi-Oh! 5Ds is set in a distant future where the residents of the poverty-stricken town called Satellite provide the manpower to sustain a utopia called New Domino City (Neo Domino City in the Japanese version), a futuristic version of the fictional Japanese metropolis called Domino City where some of the events of the original Yu-Gi-Oh! took place. The story centers around five characters known as Signers, who have birthmarks bearing one part of a monster called the Crimson Dragon (which saved the world in the past, by sealing demons known as the Earthbound Immortals into the earth as the Nazca Lines). The main character, named Yusei Fudo, is a Signer. Each Signer has a unique dragon monster. In later episodes, they fight Dark Signers—duelists who try to revive the Earthbound cards. Yu-Gi-Oh! ZEXAL is set in a new city, Heartland City, and features far more futuristic technology than seen in 5D's; Duel Disks are now tablet-like devices called D-Pads which link with D-Gazer communicators to display images through Authentic Reality rather than holograms. The story centers around the "Numbers", scattered Xyz Monsters which are also the memories of the mysterious being known as Astral. Astral teams up with amateur Duelist Yuma Tsukumo in order to recover the "Numbers", but other parties are hunting the "Numbers" as well; Kite Tenjo, who works for Dr. Faker, and the Vetrix Family, out for revenge against Dr. Faker as their hunt for "Numbers" brings them into conflict with one another. Yu-Gi-Oh! ARC-V is set in another new City, Paradise City (Maiami City in the Japanese), where new Duels called Action Duels are the latest craze. Duel Disks have returned to focusing on holographic technology, but the ARC System used in Action Duels enables Duelists to interact with the holograms with mass. Action Duels involve huge and varied Fields, and contain Action Cards that can aid the flow of a Duel. The primary character is Yuya Sakaki, son of the pioneer of Action Duels and co-developer of the ARC System, Yusho Sakaki, who during a match with the Pro League Champion creates a new Summoning technique; Pendulum Summoning. This newfound Summoning draws the attention of the Leo Coporation's CEO Declan Akaba, while as the Arc League Championship unfolds greater powers involving Fusion, Synchro and Xyz Summoning begin to take hold. The early chapters of Yu-Gi-Oh! feature a variety of different games; but from the Duelist Kingdom arc onwards, the focus is shifted to a card game called Duel Monsters. Duel Monsters is played using a holographic image system created by Seto Kaiba (following his first match with Yugi). In the manga and first series anime, these were initially performed on tables, using holographic tubes, while the second series anime uses huge holographic fields. Starting with the Battle City arc, (as well as the series that followed), duels are performed using portable Duel Disks, invented by Seto Kaiba, which allows duels to happen anywhere. There are several games in the Yu-Gi-Oh! anime and manga that were originally created as fictitious games for the series and was later turned into real games or video games. Magic & Wizards (M&W) — the original name of the card game, used in the original Yu-Gi-Oh! (Japanese and English versions) manga, Yu-Gi-Oh! R and in the Japanese version of Yu-Gi-Oh! GX. In the case of the English manga, the game is renamed Duel Monsters in later-released chapters. Duel Monsters — used in Toei Animation's Yu-Gi-Oh! anime, the second series Yu-Gi-Oh! anime (Japanese and English versions), manga (English version only), and film. The name is introduced to replace Magic & Wizards, probably due to its similarity to Magic: The Gathering. Yu-Gi-Oh! Official Card Game: Duel Monsters (Yu-Gi-Oh! OCG) — the original name of the real Yu-Gi-Oh! card game released by Konami, used mostly in Asia. Yu-Gi-Oh! Trading Card Game (Yu-Gi-Oh! TCG) — the name used in locations where Upper Deck Entertainment distributed the Yu-Gi-Oh! OCG, whose distribution has since been taken over by Konami. Designed by Kazuki Takahashi, Magic & Wizards (M&W), is a popular card game worldwide. Compared with its predecessor, M&W was very simple when it was first introduced in the manga: there were only two types of cards (Monster & Magic Cards); the result of a monster battle only relied on the Attack and Defense Points of the monsters and the effects of Magic Cards (which only appeared occasionally). According to the author, the game was designed as such because he felt that the rules of Magic the Gathering were too complicated, and he wanted to create something similar but simpler. The original plan of Takahashi was to phase out M&W, which took him only one night to design, in just two episodes. After the first appearance of the game in the manga (in Volume 2, Duel 9), the reader response on it was enormous, and Shonen Jump started getting calls from readers who wanted to know more about the game. Takahashi realized that he had hit on something, so he modified the storyline to feature more of the card game. With the advance of the manga, the game continued to evolve, becoming more complicated. The similarities between the games, of note card design (brown with an oval on back), effects and terminology (discarding, graveyard, sacrifice), usage, and pictures (including occult or religious based icons, alluding to the early days of Magic: The Gathering) are all there. The name of Magic's creator is mirrored through the creator of Duel Monsters, Pegasus J. Crawford (Maximillion Pegasus in the English versions), whom both share the same number of letters. Magic & Wizards has been brought to life in three versions, by two different companies. The first version, known as the Carddas version, was first released by Bandai in September 1998. Only three boosters had been released for this version before the license of the card game was sold to Konami later. The game was popular, although it used a simplified and modified version of the gaming rule used in the manga, and is less faithful to the manga compared with Konami's versions of the game. The second version of the Yu-Gi-Oh! cards was released by Konami on December 16, 1998, included as special pack-in cards in the first Yu-Gi-Oh! video game, Yu-Gi-Oh! Duel Monsters. These cards are not to be mixed up with those of Yu-Gi-Oh! OCG released later by the same company. The two versions are different in terms of design, with the looks of the former closer to those in the manga, to an extent that their effect texts are all directly quoted from the manga. Only 10 cards were released for this version, and Konami didn't have any gaming rules for these cards, as they were intended for collection purpose only. They cannot be used in the later-released Yu-Gi-Oh! OCG. The third version, Yu-Gi-Oh! OCG, was first released on February 4, 1999, by Konami. The gaming rule of this version is much more sophisticated and mature compared with the Carddas version, while at the same time does a much better job in preserving the style and feeling of M&W. Succeeding the popular Carddas version, Yu-Gi-Oh! OCG was an instant hit. And on March 1, 2002, the English version of the game was brought to the U.S. by Upper Deck Entertainment under the new name, Yu-Gi-Oh! 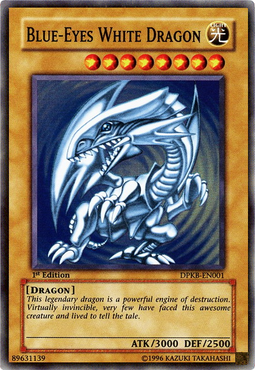 Trading Card Game, with the release of its first set, Legend of Blue-Eyes White Dragon. Later on in the same year (March 19), Konami released its first Yu-Gi-Oh! videogame in the U.S. for Gameboy Color, known as Yu-Gi-Oh! Dark Duel Stories, a translation of Yu-Gi-Oh! Duel Monsters 3: Tri-Holy God Advent. Currently, Yu-Gi-Oh! OCG/TCG have been released in more than 40 countries. Dungeon Dice Monsters (DDM), known in the Japanese manga as Dragons Dice & Dungeons (DDD) — a dungeon crawl boardgame where the tiles are created by unfolding the faces of 6-sided dice. Video game: Dungeon Dice Monsters. Capsule Monsters, a board game inspired by the earlier Capsule Monster Chess. Among the four, Dungeon Dice Monsters and Capsule Monsters have been released as real collectible games, but neither proved popular, and currently no more new figures or cards are released. On March 29, 2003, Mattel released the English version of the first booster of Dungeon Dice Monsters in America, under the title DragonFlame. But so far, only three of the seven boosters in Japanese version have been released, with the last one released in June 2003. Mattel also released the Yu-Gi-Oh! Capsule Monsters Collectible Figure Game in North America and Canada, but only produced 1 Booster Pack and a two player Starter Set. All Yu-Gi-Oh!-related video games are produced by Konami. The English version video games generally use the 4Kids English anime names, as opposed to the Viz English manga names, which are nearly the same as the Japanese names. At Comic-Con 2006 Konami announced that the Yu-Gi-Oh video games had sold a total of 17.5 million copies world wide. Each game generally includes a few promotional cards for use with the Yu-Gi-Oh! TCG. The Game Boy Advance games with "Expert", "International", or "World Wide Edition" in the title follow the rules of the OCG/TCG much more closely than the ones without. As well, "International" versions generally have multiple languages on all versions, and all versions of a given "International" title can play against each other via game link. Several books based on the manga and anime have been released inside and outside Japan. ↑ Brevet, Brad (13 August 2004). "Yu-Gi-Oh! Trading Cards Stolen!". CraveOnline Media, LLC. Retrieved 14 May 2016. This page was last edited on 18 April 2019, at 18:05.